You can count on an amazing sleep the night after a Justice Bus trip. Trips demand your full energy and constant attention. But, I promise you this: You will never regret the experience. Trust me. I love the feeling I get at the end of a Justice Bus trip. I feel like I’ve run a marathon and finished first. But, I always feared others—especially clients and volunteers—wouldn’t feel the same way. I was wrong, of course. While writing a recently-published article about the Justice Bus Project for the Clearinghouse Review, a national public interest law journal, I was reminded of the time when it really hit me it wasn’t just me who loved squeezing every last bit of energy out of myself during trips. In June 2012, I joined 12 summer associates from the law firm Paul Hastings on a Justice Bus trip to Napa. 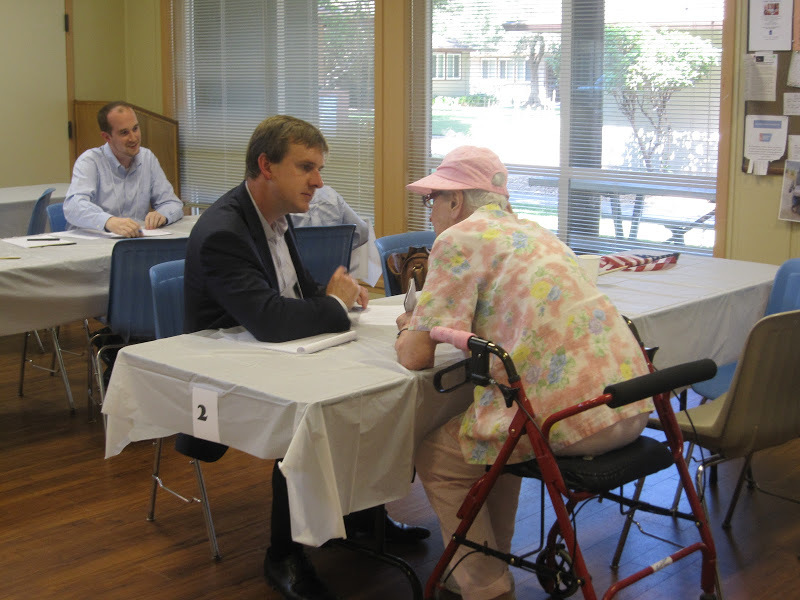 The mission for the day was to work with Legal Aid of Napa Valley to provide seniors—all living in a low-income senior residence facility—with assistance creating advance health care directives and simple wills. Each Paul Hastings summer associate was scheduled to meet one-on-one with clients. And we were expecting a lot of seniors that day. Trying to calm their non-existent nerves, I counseled them with adages like, “Take your time” and “Don’t rush.” How futile those sound in retrospect! 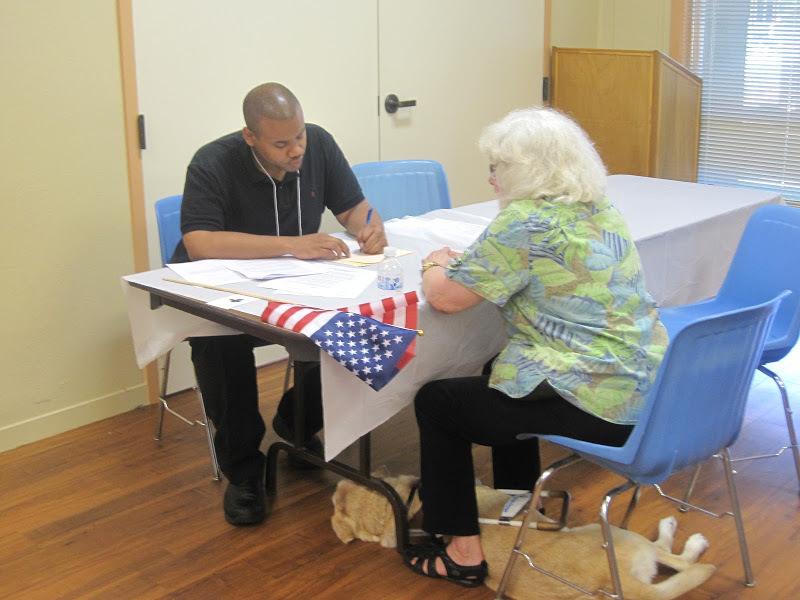 A Paul Hastings summer associate volunteered with the Justice Bus to bring free legal services to seniors living in an isolated area of Napa County. The four hour clinic was a whirlwind. Seniors kept coming in, summer associates refused to take breaks, and I was worried sick that everyone was going to collapse! When all was said and done, 43 seniors were helped. That’s nearly one client per hour per summer associate. In other words, one advance health care directive completed and executed or one simple will drafted each 60 minutes by each volunteer. Amazing! But, for me, terrifying as well because I thought, for sure, the volunteers must be taxed beyond their liking. Or, even worse, the clients felt drained because of the busy scene. I was wrong. Absolutely, unequivocally, and embarrassingly wrong. To one summer associate, I begged forgiveness: “Jen, I’m so sorry for the ridiculously busy afternoon!” To a client I pleaded for mercy: “I apologize for the hectic display, Mr. Beatty!” Both looked at me like I was crazy. They were grateful for the opportunity, and they didn’t want to hear me apologize for it again. Some of the clients cried while telling me how they’d been praying for this day to come, having no real access to legal help. The summer associates gushed as they talked about the progress they’d made with clients and the feeling of pride the day had brought them. And I was left wondering how on earth I once believed that I, and I alone, was the only person happy to throw every last ounce of energy into a Justice Bus trip. 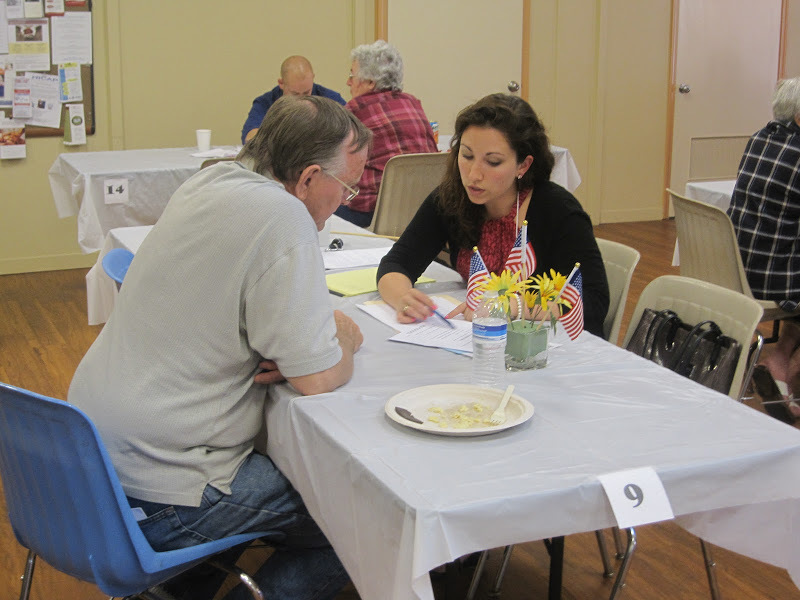 For many seniors, Justice Bus clinics provide their only access to vital legal help and assistance. We all love committing our time and energy to helping people. And the Justice Bus Project gives us the chance to do just that. That’s what makes the program so amazing. Trips give us a wonderfully rare situation when all our interests align. When clients get the help they desperately need. When volunteers, like you, realize what a difference you can make. And we all sleep better. Some out of exhaustion, others out of relief. Michael Winn leads OneJustice’s statewide Pro Bono Support Program. 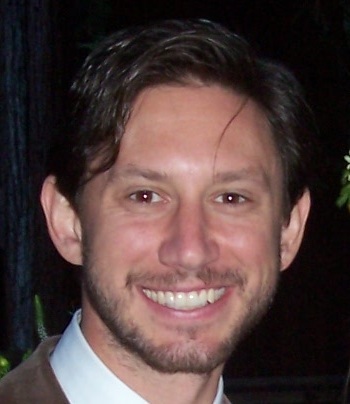 Michael Winn, Senior Staff Attorney, leads OneJustice’s statewide Pro Bono Support Program. Based in the San Francisco office, Michael is responsible for developing and stewarding OneJustice’s innovative pro bono programs, including the Justice Bus Project, which connects urban pro bono resources to isolated and rural communities in California, and the Law Student Pro Bono Project, which links law student volunteers to pro bono opportunities at local legal services organizations. In his work, Michael often advises legal services nonprofits, law firms, law schools, and in-house counsel on how to improve current pro bono partnerships and create effective new pro bono programs. Before joining OneJustice, Michael served as interim executive director at Start Small. Think Big., a nonprofit providing financial development services and civil legal assistance to low-income communities in the South Bronx, and spent several years as a litigation associate at Weil, Gotshal & Manges in New York.